“Progress never stops. 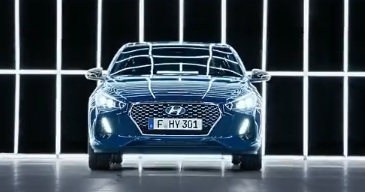 Move on” – this is the message conveyed in the TV advert released by Hyundai UK to promote the New-Generation i30. The 30-second spot showcases the new i30 Tourer, which, with its “stand out design”, “exciting new entertainment features” and the latest in safety technology, has truly set a new benchmark. According to the South Korean multinational automotive manufacturer, this is one of the biggest boots in the segment, ensuring a best-in-class standard safety package, including High Beam Assist, Driver Attention Alert, Lane Keeping Assist, and Autonomous Emergency Braking. The New-Generation i30 features also impressive connectivity, with LIVE Service, Apple CarPlay and Android Auto available through a 8″ touch screen display, multiple audio options, and a wireless charging system for smartphones. Hyunday New-Generation i30, known as the Wagon in America, is making its first public appearance at this year’s Geneva Motor Show, which started today, with two press and trade days, and set to be open to the public from 9th to 19th of March. The song used in the ad is the 2015 single “Get On Up” by the instrumental livetronica, hip-hop and jazz musical group Big Gigantic.